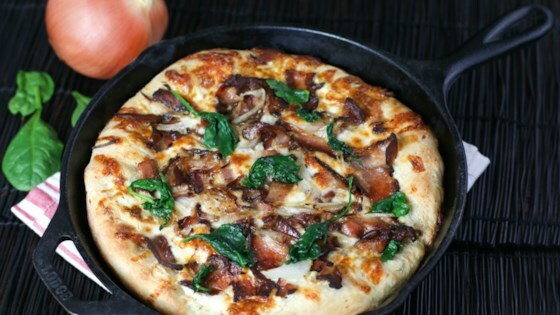 "Skillet breakfast pizza is hot, crispy pizza dough that is oozing with veggies and cheesy bacon yumminess. Plus, it's low in calories!" Place bacon in a large skillet and cook over medium-high heat, turning occasionally, until evenly browned, about 10 minutes. Drain on paper towels; crumble into small pieces. Heat olive oil in a skillet over medium-high heat. Add onion; cook and stir until translucent and starting to brown, 7 to 8 minutes. Remove from heat; transfer to a bowl. Roll out pizza dough into a 12-inch circle and press into the bottom and 1 inch up the sides of a well seasoned 10-inch cast iron skillet. Fold the edges of the dough under and crimp like a pie. Mix ricotta cheese and garlic powder together in a bowl; spread over the bottom of the crust. Scatter bacon, onion, mozzarella cheese, and black pepper on top. Place cast iron skillet over high heat until mozzarella cheese starts to melt, about 3 minutes. Transfer skillet to the preheated oven; bake pizza until crust is lightly browned, about 18 minutes. Heat a large skillet over medium-high heat and coat with cooking spray. Add spinach; cook, stirring frequently, until wilted, about 1 minute. Transfer to paper towels to drain excess moisture. Place spinach over pizza; slice into 8 wedges. Too many steps and much trouble for breakfast! You can just make it and put it into the oven like making a regular pizza. Sounds good though. I might try it. It needed salt, but was enjoyed by all. Didn't hurt that it was a stunning dish to present as well!